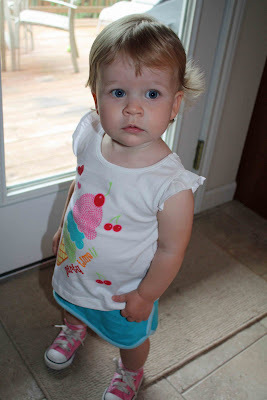 (Make sure and read to the end for a couple announcements...) Hello and welcome to this week's edition of From Courtney's Closet, my blog challenge where I make a card based on one of my daughter's outfits. If you're new to my blog, you can check out all of the past weeks here. So I have to admit - I really love this week's photo of Courtney! I took it this past weekend at a friend's birthday party. I knew I needed to get a photo of Courtney in this outfit asap, because silly me, I went and bought a white shirt again!! I *really* should know better. But really, how can I resist such cute tops? Especially when they go with such cute skirts?? And when they are only $3.50 at Walmart?!!?! But of course - we had spaghetti for dinner that night, and I didn't change her shirt beforehand, and now it's covered in tomato sauce stains. *sigh* But anyway, enough about that - let's talk about the card!! (but real quick, I also have to point out her pink Converse!!! How cute are they??) :-) As you may know if you saw this post, where I nearly hyperventilated because I was so excited, Melanie Muenchinger asked me to be one of the guest designers for her latest Gina K release, Wee Tees!!! I just loooove this set! And of course it's very *me*, since I'm obsessed with baby clothes!! Today Melanie's featuring another card I made with this set, as well as a little getting-to-know-me thing, so check it out. :-) One thing I discovered with her Little Tees set is that it's super fun to combine it with the Stampin' Up ABC Images set. Well, it's even more fun with Wee Tees!! There are so many little images in that set that are just perfect for a onesie!! 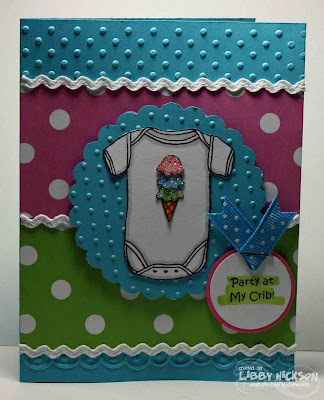 For today's card I used the ice cream, adding a couple additional scoops of ice cream to match Courtney's shirt, and coating them with Dazzling Diamonds glitter. Courtney's shirt says "Party Time", so I thought this sweet "Party at My Crib!" saying from Wee Tees was just perfect! I also used a new toy - I just picked up a couple sets of Cuttlebug border embossing folders, and used two of the folders on this card. So what do you think? Do you feel like making an ice cream card? Or perhaps finding inspiration from these fun, bright colors? If you do make a card, please link it up back here with the Mr. Linky thing below. Last week's safari outfit inspired some ADORABLE projects!! But I was absolutely thrilled to have a new name joining my little challenge - Cathy Tidwell!! She is such an amazing stamper, and of course created a real stunner for this challenge. 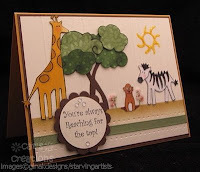 I absolutely adore her card - the animals, the flower soft flowers, the tree she created from cloud stamps, everything!! Cat, I'll send you my sidebar blinkie, and would love it if you choose to display it on your blog! And now for a couple of housekeeping announcements - we're going on a family vacation next week, so I won't be posting a From Courtney's Closet challenge. So check back in TWO WEEKS for the next one. Which means you have two weeks to play this week!! No excuse not to join in! :-) And... in two weeks it will be the ONE YEAR ANNIVERSARY of this little challenge! Of course I have to celebrate that just a bit - so make sure and tune in for that!! That would have normally been the "Courtney's Playdate" Thursday, but because it's our FCCC anniversary I'm going to skip it this month. Plus - nobody has emailed me yet saying they'd like to play along...!! *sniff* ;-) Alrighty - thanks so much for stopping by today, I need to get this posted and hit the hay! oh no, are you ging to make me buy the ABC set?? ;) Too cute! the card is great Courtney and her Converse rock! Love Cathy's card, I didn't realize those were cloud stamps! very cool! Libby, Libby - you and Courtney make quite a team! The card - way too cute! Love the glitter on the ice cream. Makes me want one. Have a great vacation! I will miss your creations while your gone! This card and Ms. Courtney are adorable! Love it! Yay, 2 weeks to play this time! Maybe I'll FINALLY get one done again! I had planned on doing this last one all week long, but the time just got away from me! Have a nice vacation! Oh this is adorable, so sweet. Oh goodness, look at baby girl...she looks like a big girl in her syling outfit! What a sweetie! I asked Erin to look for pics of Cole so I am working on it! I have the PERFECT stamp for this week's challenge too! New and uninked...what could be better...make me use those stamps! Have a great time on your vacation...and I bought some packing tape at the store finally! Congrats on being Melanie's GT. Cute photo. Yeah, two weeks. I hope to get some stamp time in. Enjoy your vacation. OMG Libby!!! Your card is just DARLING!!! I love that onsie with the ice cream cone!! :) Sweet pic too!! Cute, cute card! Hope to hear from you soon. oh my goodness! I LOVE that outfit & what a cutie she is in it (the pink converse are the cherry on top if there was one) have fun on vacation!! Oh my Goodness! I LOVE those pink converse!! How stinking cute is that!?? and her outfit, She be styling!! LOL!! She is just so adorable, just like your card too! I am loving what you are doing with Mel's new set too, you are rocking it! And have fun on your vacation!! And I'd be proud to put the little thingy on my blog! Awwwwwwww, that's a really adorable picture of Courtney -- she looks SO SWEET! Such a big girl, out socializing these days...pretty soon you won't be able to keep her home. Such a celebrity...her social calender will be full all the time. She'll be invited for speaking engagements...going on the road...writing her memoirs. Super cute card, too. Love the polka dots and sparkle! Enjoy your vacation! Just found your blog (well, long enough ago to complete a card for your challenge). LOVE the FCCC!!!!! I will definitely be back to play again. I'm SUPER busy right now, but I will try to email you wtih some "playdate" options in the next week or so. I actually just recently created a card based on my DD's outfit (and I stamped her jeans! ), you can check it out on my blog if you'd like.